These tennis birthday cake truffles were from last August for my friend's mother-in-law's birthday. 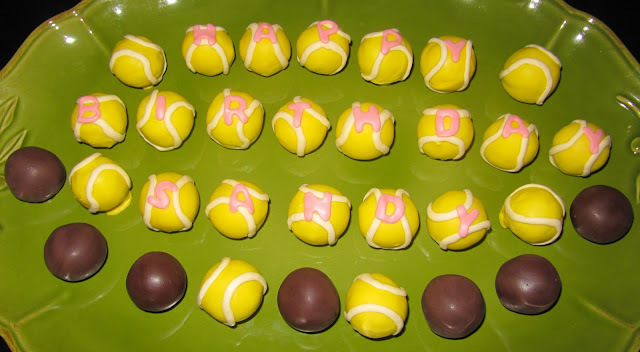 The birthday lady's hobbies were tennis and yoga, so I chose to make tennis balls and my friend wanted the truffles to say "Happy Birthday Sandy!" Since these treats were for a slightly more mature gathering, the truffles are butter cake inside and I made them slightly less sweet (with less frosting). 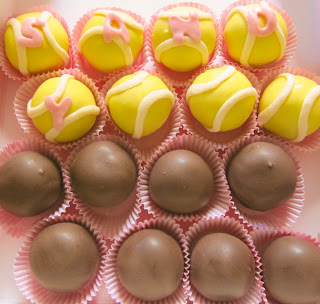 My friend had been craving chocolate cake truffles too so I just made some for her and added those in! Packaged and ready to for some birthday fun! 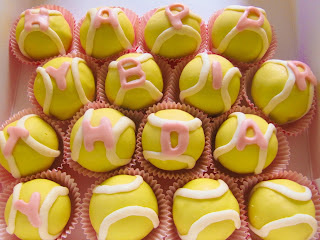 I split up the tennis balls without letters in separate boxes because I didn't want to cut up the words.